This is an image of one of the Activities pages of the White Caps Good Samaritan School of Nursing Annual of 1951. 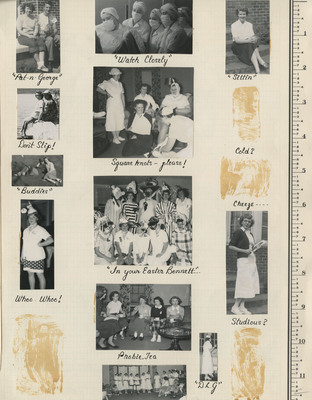 The page includes photographs and annotations indicating the various activities in which the nursing students of the Good Samaritan School of Nursing participated. The Activities Page of the Annual is missing photographs, as demonstrated by the yellow adhesive stains on the page. Please see the Related Resource field to view the photographs associated with this page. For a related image, refer to Nursing Student and Partner on Rock. For a related image, refer to Two Nursing Students Side-by-Side. For a related image, refer to Joking Around at the Nursing School. For a related image, refer to Instructor at the Nursing School. White Caps Staff, "The Activities Page of the Annual 02" (1951). Good Samaritan School of Nursing Photographs. Image. Submission 225.